ARNA’s 2016 conference in Knoxville, Tennessee was enriched by its partnership with the Highlander Research and Education Center and its 87-year history of participatory action research and education for social justice and action. Those attending the 2016 CARN Study Day at Highlander sampled its unique methodology of participatory learning and change, and others at the conference learned about Highlander’s role in grassroots organizing and movement building, not only in the South but in other parts of the U.S. and the larger world as well. However, Highlander’s remarkable contributions to the Civil Rights Movement, worker education, and multiple other critical social issues were often accompanied by threats to its very existence, including direct assaults on staff and Highlander’s facilities. We are reminded, for example, of the actions taken by southern white segregationists against Highlander’s involvement in the Civil Rights movement, actions that resulted in closure of Highlander and confiscation of its property in Monteagle, Tennessee in 1962. History may have repeated just a few days ago. Included below is a special communication recently issued by Highlander’s leadership. More information about the Highlander Center is available at https://www.highlandercenter.org/. New York Times news coverage of the fire may be accessed at https://www.nytimes.com/2019/04/03/us/civil-rights-center-fire.html. Please help us ensure that Highlander remains a sanctuary for social justice by rebuilding with us through your donation at https://donatenow.networkforgood.org/1417777. REGISTER NOW FOR ARNA’s CONFERENCE IN MONTREAL 2019! As we continue to accept proposals until April 15th, register now for our 7th Annual Conference in Montreal, Québec, Canada. Hosted at McGill University, our team is working hard to bring to you another powerful conference around the theme of: Repoliticizing P/AR: From Action Research to Activism. We can’t wait to see you there and more information about travel and accommodations will be posted shortly. 2019 CONFERENCE CALL FOR SUBMISSIONS NOW OPEN! We are so excited to announce that the call for submissions to ARNA’s 7th annual conference in Montreal, Quebec, Canada are now open! Please use the Google Form linked here to submit your proposal. We look forward to seeing them! VISIT http://arnawebsite.org/call-for-proposals/ for more information on themes and types of presentations. The Action Research Network of the Americas (ARNA) joins other professional, scholarly and activist organizations in our commitment to just immigration policies, a decriminalization of those seeking asylum and the immediate reunification of immigrant families that have been torn apart at the border. ARNA is gravely concerned about the state of the more than 2300 children who have been separated from their parents and remain in custody housed in shelters away from their families. ARNA stands with those who are deeply concerned about challenges to the health and well-being of immigrant families and the need for developing immigration policies that are humane and in the best interests of children and families. We stand in solidarity with those core values that have developed over the course of our history that respect the dignity and worth of all people and that recognize that our institutions must evolve and respond in ways that maintain what is best in a vibrant democratic society. Therefore, ARNA joins with civil rights groups and professional medical and educational associations in demanding that these children, parents and other family members be reunited as quickly as possible to minimize any long-term harm to their mental and physical health; and in demanding the decriminalization of asylum seeking. We assert the clear need for children and families to be assessed for and receive any needed mental or physical health care by qualified health care professionals. Furthermore, ARNA believes that a participatory research agenda – shaped by the wisdom, wounds and desires of members of the most affected communities – must be generated to investigate the impact of these policies on immigrant children, families, social workers, volunteers, health care practitioners, and educators. It is important to hold our federal government accountable for the individual, cultural, racial and community level impacts from this failed policy. The Action Research Network of the Americas is an organization dedicated to advancing knowledge democracy and participatory, action-based research approaches in support of those most in need throughout the Americas and around the world. ARNA stands ready to assist in supporting local, trans-local and trans-national participatory research to investigate the impact of these policies. Our goal in doing this is to provide information to policy makers, activists, community members and young people in the next generation, to document the profound impact of this painful moment in our national history, to honor the struggles of those who worked so hard to seek asylum, to hold government accountable, to teach this history, to liberate buried stories of pain and survival, and to develop informed and humane policies that are aligned with our core values of justice and due process in a democratic society. ARNA stands firmly beside those who are most marginalized in the Americas even as we continue to fight for our own endangered democracy. Throughout the Americas ARNA members collaborate in solidarity with communities resisting state violence, colonization, and “child snatching” practices. Make sure to tag us, tweet at us (@ARNAresearch) on Twitter and Facebook, using the hashtag #ARNA2018 while you are here to share your learning! Enjoy your time! We would be very grateful if you could circulate this email to colleagues in your institutions, and your other networks. The Call for Contributions Deadline is May 14th, 2018. REGISTER TODAY & WIN AN iPAD! 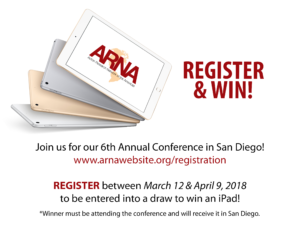 Register between March 12 and April 9, 2018 to join us in San Diego and be entered into a draw to win a brand new Apple iPad! Winner must be attending the conference and will receive their prize in San Diego. Please visit the link below, a call for videos for the first edition of the Participatory Video Festival for social sciences, 8-9 May 2018 in Ghent. The Festival’s aim is to push the PV agenda and learn from the most innovative and relevant video-using trends in- and outside academia; in participatory action research, visual ethnography, visual arts, activism, advocacy work and so on. This is a call for papers for a special issue of the journal International Review of Qualitative Research on the topic of participatory action research (PAR). We are looking for innovative papers that address a broad range of topics focusing on PAR as a research methodology, but including controversies and ethical challenges, social justice issues, work with Indigenous peoples and other populations, PAR in different countries and contexts, and the roles of research participants. Readers of this journal come from a broad range of backgrounds as qualitative researchers and our hope here is to provide them with a sense of the multitude of ways in which PAR is being carried out to address critical problems from around the world. We ask that papers provide a definition of PAR, describe the PAR methods you use in some detail, and show how your work benefits communities and organizations. We ask that you submit a 1-2 page summary of your paper by March 31. Invitations for submissions of full manuscripts will be sent by April 30, 2018 with final drafts due by December 31, 2018. Making a difference with action research and engaged scholarship in projects and innovations goes hand in hand with the overall EURAM 2018 theme ‘research in action’. Action research involves close cooperation between practitioners and researchers to bring about sustainable change. Engaged scholarship has a broader perspective as a participative form of research for obtaining different perspectives of key stakeholders in studying complex problems. Action research and engaged scholarship offer a grand opportunity to address key challenges in project management in a novel and constructive way. This track calls for papers involving action research, collaborative research, design research, co-creation of knowledge and beyond. The following message is from Nathan Snyder. Please see message and links below. I am inviting you to participate in a Delphi study designed to identify the unique characteristics of the pedagogical method, flipped learning, from those who use it and advocate for its use, including secondary-level and college-level teachers. If you agree to participate, you will be asked to clarify what pedagogical attributes should be associated with flipped learning to coalesce educators’ understanding of its use. The goal of this effort is to operationalize what is meant by flipped learning and to identify its features, through analysis of experts’ opinions, that lead to successful implementation of its use in the classroom. Below, I’ve provided more details about the time commitment and scope of the study. First, the Editors of Educational Action Research Journal are calling for the submission of high quality manuscripts to be considered for publication in a Special Issue on Lesson Learning Studies. Please find attached full details. Extended abstracts of approximately 1000 words are due on 24 October 2017. Second, we are putting out a call for Special Issue on other topics. We are asking for proposals for Special Issues on a topic of the proposed editor’s choice. If you would like to edit a Special Issue please email Melanie.RussellSmith@nottingham.ac.uk your proposal which needs to include: a CV of the editor, the proposed topic and suggestions for article topics and editors.